Beats by Dre Powerbeats Pro are almost here. It's all been a bit quiet in the Beats labs of Dr. Dre in recent years. The headphones and buds powerhouse has not released anything major since the excellent Studio 3 Wireless noise cancelling headphones, way back at IFA 2017. But just before you all – aha haha – 'forget about Dre' (that's a hip-hop joke), Beats are back back back, with Powerbeats Pro. Beats Powerbeats Pro take practically all the tech from Apple AirPods (apart from wireless charging), and pump it up with gym-friendly features – Beats says they'll boast rock-solid fit and big, big sound. Powerbeats Pro is out in May for £219/$219. The first trailer was just released and as you'd imagine, it is star studded and fierce. 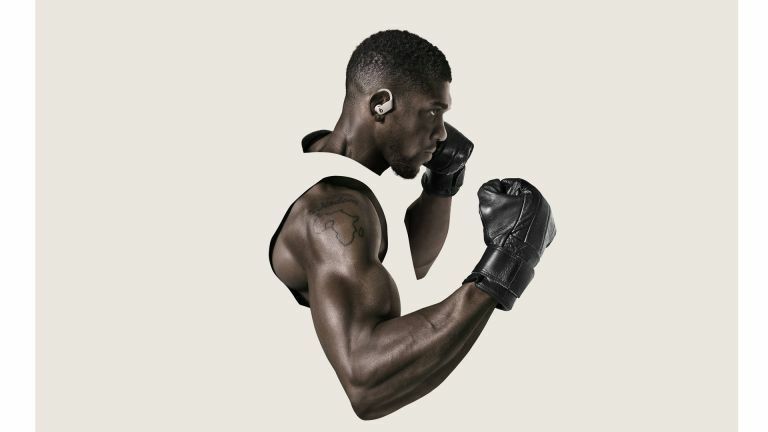 This Powerbeats Pro promo features some of the greatest and most photogenic athletes in the world, from Simone Biles to Anthony Joshua to Owen Farrell. The music is by Beck and the trailer is directed by Hiro Murai, who did Childish Gambino's Internet-destroying This Is America promo video. All that being said, and as awesome as it is, you still can't charge these buds wirelessly and they are quite 'affordable premium', price-wise. Beats Powerbeats Pro: will they be any good? • Update: I just tried the Powerbeats Pro and from a short exposure, I'd say they are officially good. They both sound very impressive, thanks to a new piston driver – the last headphones I saw using that approach cost £400 and were proper audiophile gear – and seem to fit incredibly well. The video above showing how they stay in during all manner of activities wasn't done with CGI or glue. They don't just sound good with workout music, even Miles Davis' jazz trumpet came over well. As with several more recent true wireless buds you get very good stereo separation. Having the same controls on both ears is a masterstroke as well. When you're working out, you don't want to have to worry about your buds falling out, or how to dial volume up and down or skip tracks. Like when Miles Davis suddenly comes on when you're trying to achieve Beast Mode, for instance. Powerbeats Pro still seem a little expensive. My favourite true wireless buds for running and gym are Jabra's Elite Active 65t and as you can see below, they can be had way cheaper. However, these new Powerbeats undeniably sound better. The new Powerbeats are true wireless buds (ie: they connect via Bluetooth and there's no wire joining them together) designed for use as gym or running headphones, and arguably the biggest mass-market challenger yet to Apple AirPods – which I am sure Apple is well worried about, given that Beats is an Apple subsidiary. Even so, the original Powerbeats – and the Powerbeats Pro are essentially them with the wires snipped off, just like AirPods are Apple Earpods shorn of their cables – had some excellent qualities. Those over-ear hooks are a little fiddly, especially if you wear specs, and they don't anchor the buds in your ear canals as well as the in-ear 'hooks' used by most gym headphones these days. However one thing they're very good at is preventing the buds from falling out entirely. Their relatively large size also makes them easier to see if you do drop them. When using true wireless buds on a run or cycle that can be extremely useful, as anyone who's had one fall out and drop down a drain or under the wheels of a bus or bounce into shrubbery will attest. Following the usual Beats template I'm sure the Powerbeats Pro will be well made, have powerful if unsubtle sound (who wants subtlety when pumpin' iron or runnin' hard miles, right, dudes?) and the very close link Beats has to Apple means Siri integration and syncing with iOS devices will be highly slick. Whatever the value for money of the Powerbeats Pro turns out to be, sales success seems highly likely. As Luke Wood, president of Beats says, "Powerbeats are already the #1 fitness headphones in the world and they are now untethered, with all the benefits of the Apple H1 chip." That seems like a compelling pitch. We'll have a Beats by Dre Powerbeats Pro review later this month. It'll be very interesting to see whether the audio and fit are as improved as Beats claims. Shame there's seemingly no wireless charging for these buds but perhaps you can live with that. Powerbeats Pro will be available from Apple and elsewhere from May for £219.95 (UK) or $219.95 (US). Colours: Black, Ivory, Moss and Navy. Availability will initially be in the US, UK and "more than 20 additional countries and regions", including Australia, Austria, Belgium, Canada, Denmark, Finland, France, Germany, Greece, Hong Kong, Ireland, Italy, Japan, Lichtenstein, Luxembourg, Macau, Netherlands, New Zealand, Norway, Portugal, Puerto Rico, Singapore, Spain, Sweden, and Switzerland. It'll then roll out in further countries from summer. Powerbeats are AirPods-style true wireless earphones that 'deliver powerful sound for the world’s most passionate music lovers and motivated athletes'. The key features are long-ish battery life, over-ear hooks that should make it harder to have one fall out and get lost and, as on AirPods, access to Siri and speedy pairing with Apple devices – though they will also work perfectly happily with other brands' mobiles, tablets and laptops. First up the battery life of 9 hours is solid for a lightweight pair of Bluetooth buds, but exceptional for true wireless. As ever with this type of bud, the carrying case is also a battery, so you get 24 hours of playback in total. Beats' Fast Fuel recharging tech means you get 1.5 hours of playback after just 5 minutes of charging and up to 4.5 hours after 15 minutes of charging. That's class leading. Fit has also been improved – again no bad thing at all, as the original Powerbeats didn't always stay as tightly in your ears as you'd like. Lengthy testing and prototyping resulted in, says Beats, "Completely new, ergonomically angled acoustic housing that nests comfortably in the concha bowl of the ear with an off-axis nozzle." Four sizes of ear tip should ensure a decent fit, then, while the adjustable earhook has also been 'redesigned', although Beats doesn't say how. Powerbeats Pro is 23 percent smaller than its predecessor and 17 percent lighter. Sweat- and water-resistance (but not waterproofing) is also included. Handily, there are now volume and track control buttons on both earbuds. That is a neat feature that I've not seen in other true wireless buds before. In Beats-speak it is a, "fully functional, ambidextrous design." Take either bud out of your ear and the audio pauses; put it back and it resumes. Leave them unused for a while and they'll go into sleep mode. For calls, Powerbeats Pro employs speech-detecting accelerometers and beam-forming microphones, so background noise is filtered out. You can use both buds at once or a single one. The Apple H1 Chip also means you can now activate Siri without needing to press a button – just use its trigger phrase. This is the same as AirPods 2.